My thanks to Louisa for lending me this pen. I’ve been eyeing this particular pen ever since I had a chance to try it out a long while back when Louisa first got the pen. 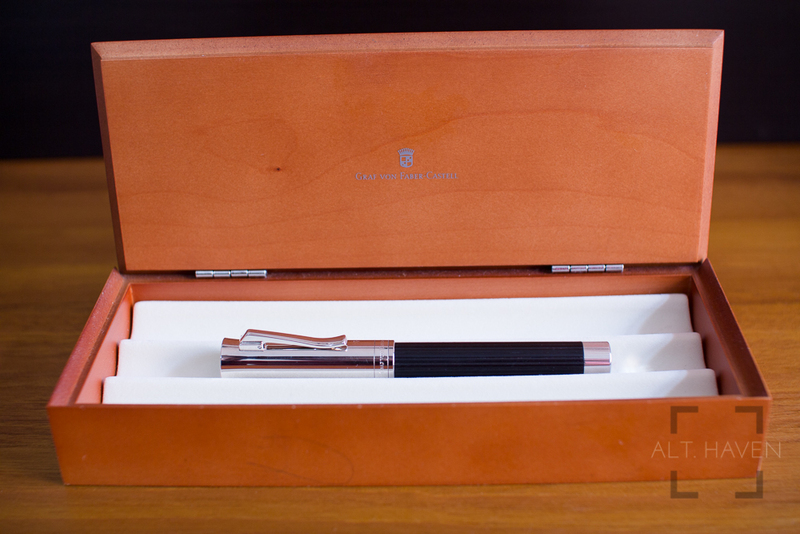 Leave it to Graf von Faber-Castell to work so well with wood as a material. They are one company that consistently incorporate wood as a material in their standard pen line up. 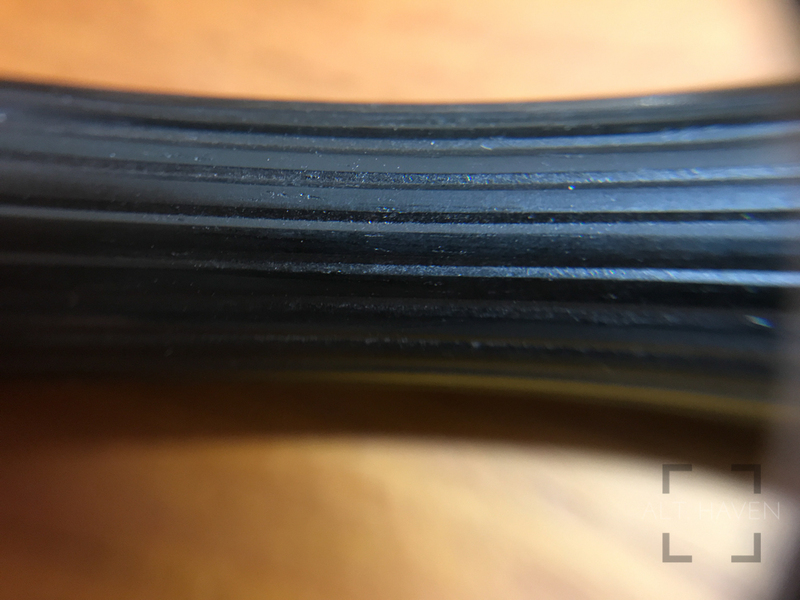 Remember the Ondoro I reviewed a long time ago? 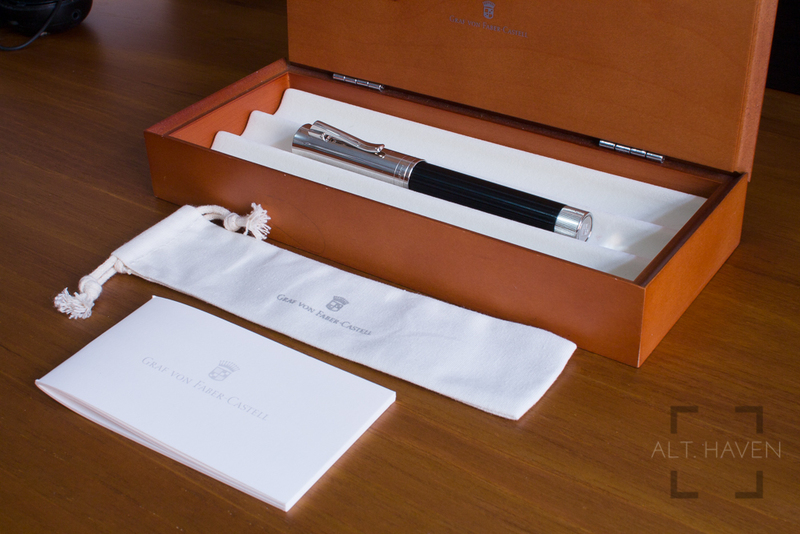 Packaging: Graf von Faber-Castell is a premium fountain pen brand and it shows in their packaging. The wooden box looks deceptively simple. 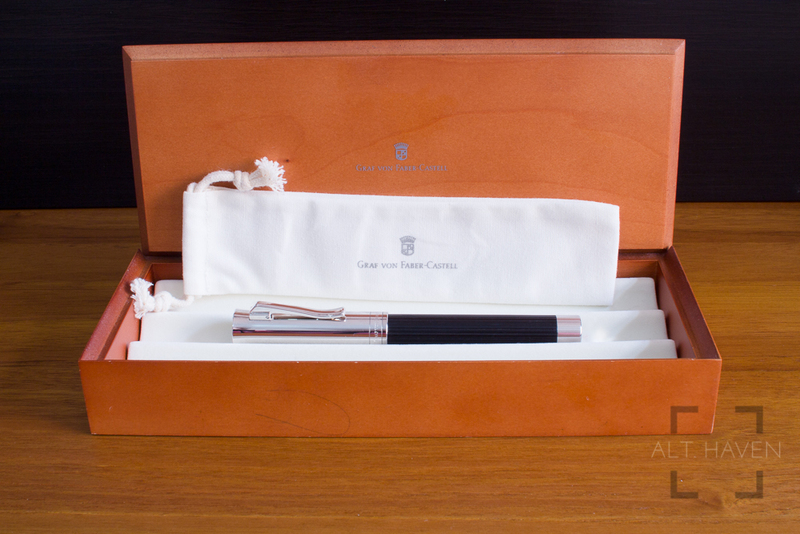 The logo of Graf von Faber-Castell is printed in a silver tastefully small size on the top of the lid. Lifting the lid, you will see a white bed with space enough for 3 pens. It’s elegant and classy. The box can easily fit onto anyone’s table and double up as a small 3 pen box. Weirdly, the pen doesn’t come in the wooden box. It comes in a cardboard box separate from the packaging itself. Regardless, I really love the way the wooden box looks and feels. This is one of the best packaging out there. 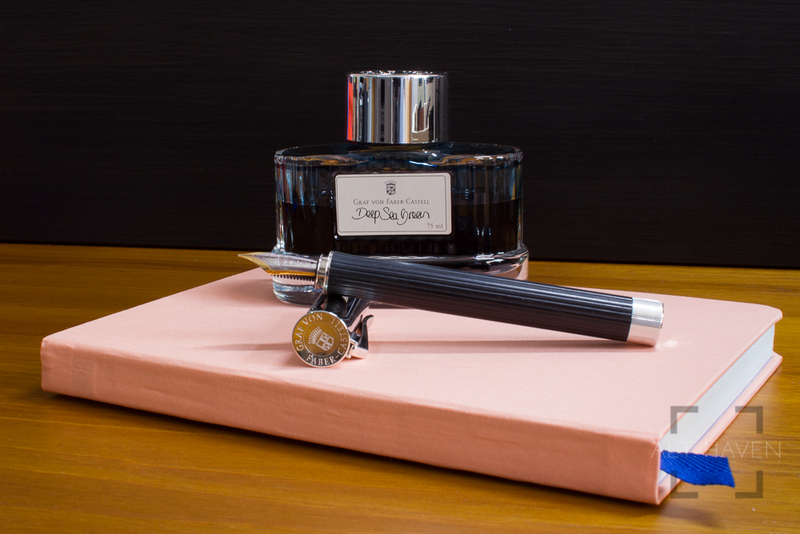 The Graf von Faber-Castell Intuition Platino Wood (from here onwards referred to the Intuition Platino) comes in 3 colours namely the Grendilla, Ebony and Pernambuco. The first two are still available from retailer but the last will be way harder to find brand new pieces. The Intuition Platino has a long shiny silver cap, a finger print magnet for sure. The clip is prominent and has a spring hinge for easily clipping. 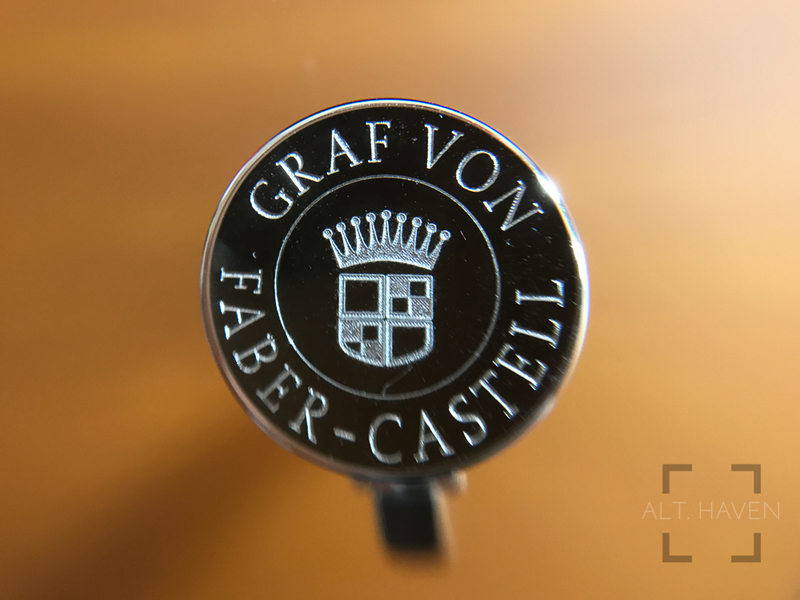 The top of the cap features the Graf von Faber-Castell logo. 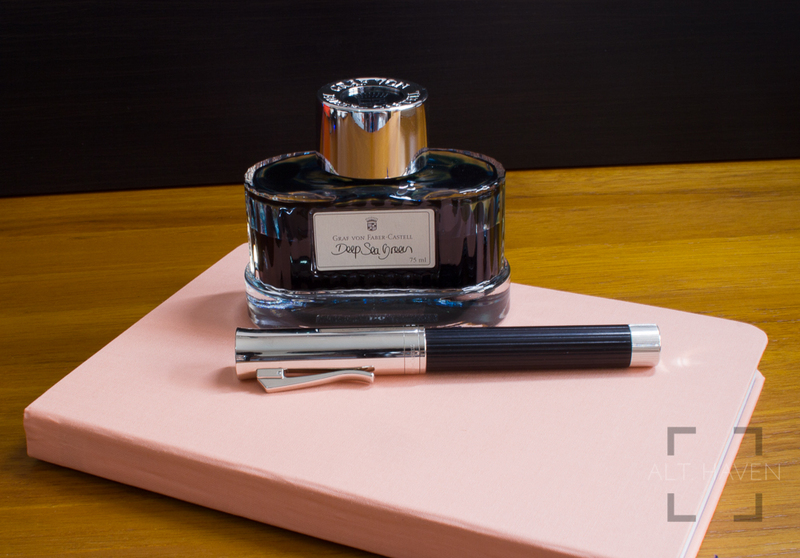 The words “Graf von Faber-Castell and Handmade in Germany” are etched at the other end of the cap. The cap can be posted to the end of the pen but it will cause the pen to be back heavy. The snap on cap pops off easily and closes with a satisfying click. More on the cap later. There is no centre band on the pen because the barrel is a seamless single piece of fluted wood. At the end of the barrel is a ridged silver twisting mechanism that released the converter and nib unit from the barrel. The wood barrel feels very nice to the touch. There is the additional nice touch of a tapering of the barrel towards the nib then it flares slightly before the nib. It forms a natural grip section for your fingers to rest on. I really appreciate this part of the design. 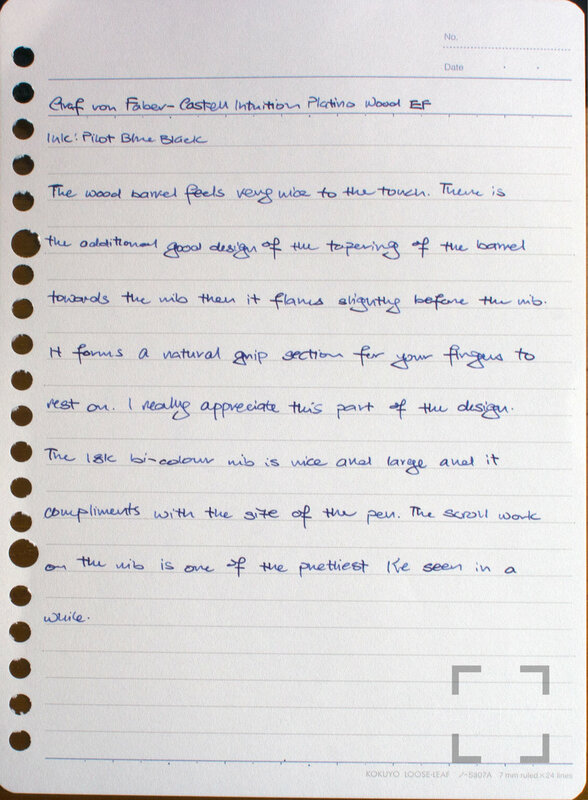 The 18k bi-colour nib is nice and large and it compliments with the size of the pen. 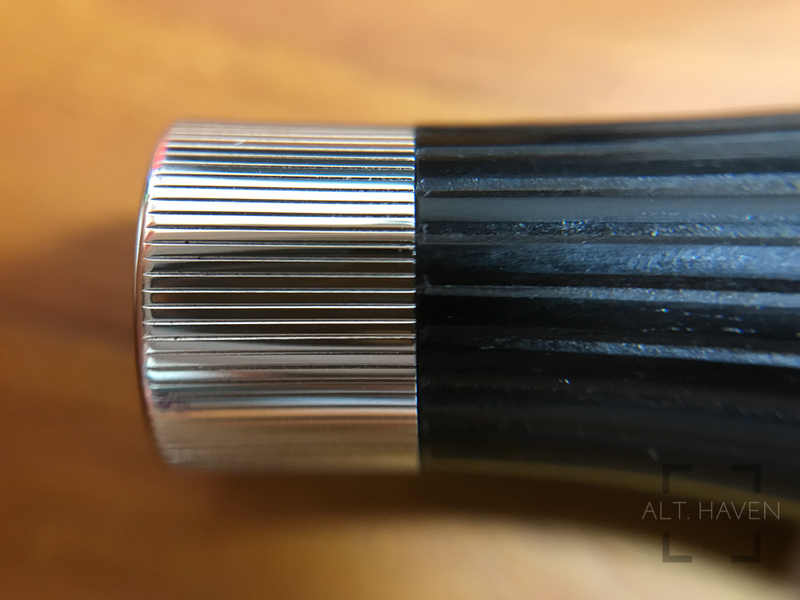 The scroll work on the nib is one of the prettiest I’ve seen in a while. 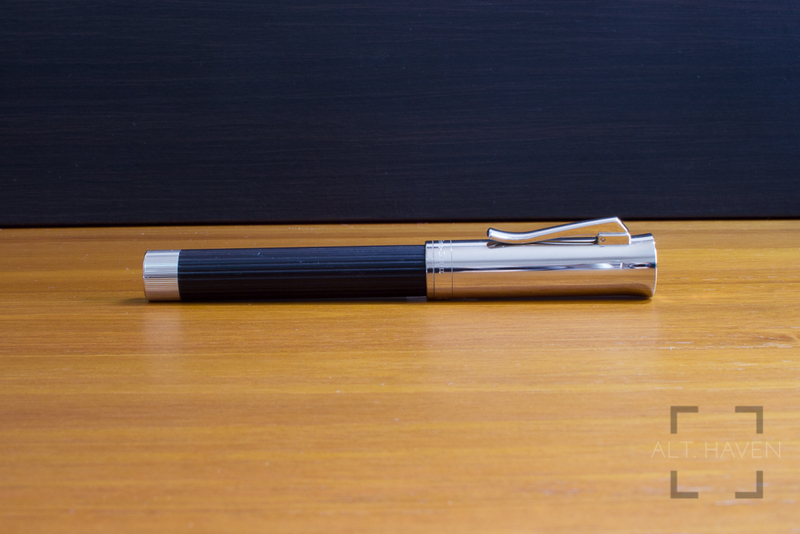 Now the special thing about the pen is the twisting mechanism at the end of the barrel. Twist that knob, the nib section with converter rises from the barrel. Once the entire section is freed from the barrel you can pull it free to wash or refill the ink as required. Once you have completed your task, re-insert the converter and nib unit back into the barrel and turn in the opposite direction. The nib will move back to its original position. This is certainly one smart way to prevent ink from staining the wood barrel by totally moving the operation away from the barrel itself. Now the writing experience itself is a total joy. I love the EF nib a lot, really a lot. Can you tell there is a big fat but coming? BUT the ink is constantly drying up in the nib even though the cap is capped on properly. Sometimes it hard starts, other times it dries up so much that it causes feathering on ink and paper combination that has never has this problem before. This is one serious flaw. Personally, I think the buyer has the right to be picky, more so for a pen of this price. It is retailing for £695 on Cult Pens. This isn’t a cheap pen, yes it writes flawlessly. 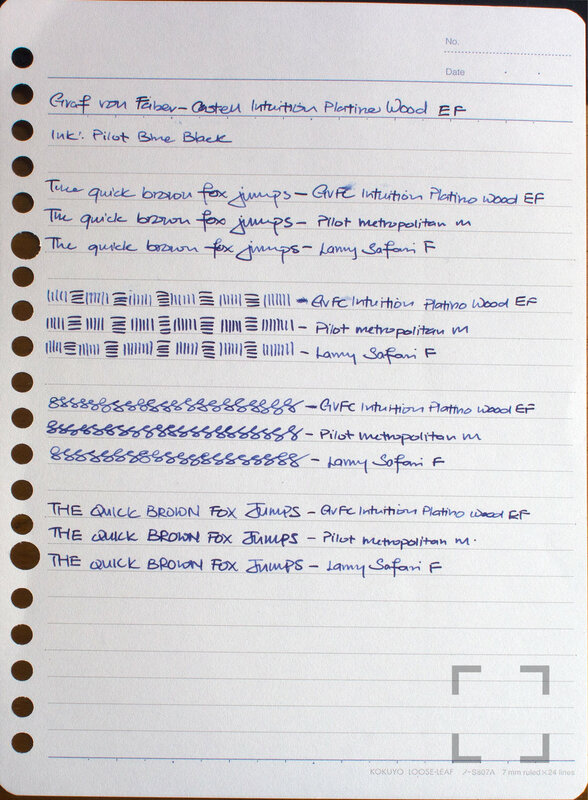 Actually one of the best EF writing experience I’ve ever tried but this one flaw is a real deal breaker for me. One other flaw that Louisa has encountered is the twisting mechanism sticking. Through her own experiments she has concluded the mechanism is highly sensitive to temperature. It takes about a week in standard non-air conditioned Singapore weather for the mechanism to get stuck. Sometimes she has to “cool” down the mechanism just so that she can twist it. I started my journey with this pen as one that is on my to buy list. I ended it with disappointment, utter disappointment. 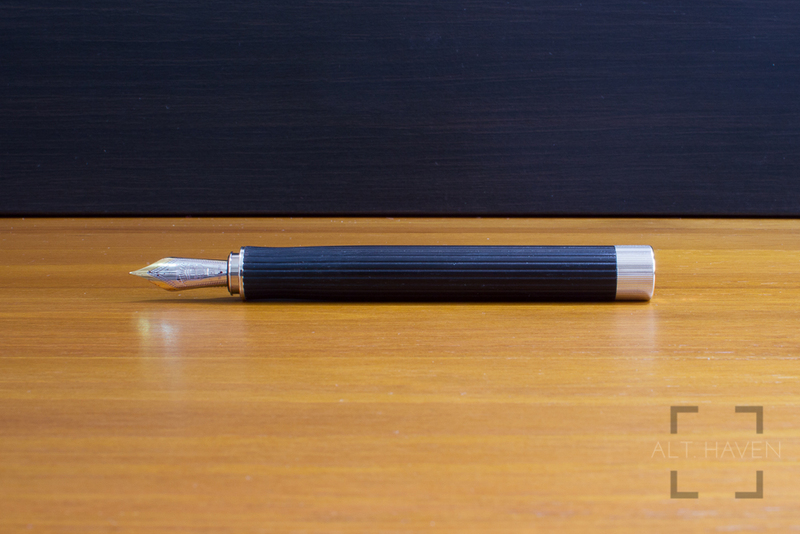 This is supposed to be a premium fountain pen and it looks for all the world to be one. It writes like one as well. However, the hard starts and ink drying up is a big no go for me. Add the sticking mechanism makes this pen out of the question for me. My wallet is definitely thanking me though.